Home › Bibliography › How Many Billboards. Gonzales-Day, Ken. How Many Billboards. MAK center for Art and Architecture, March 2010, West Hollywood. How Many Billboards? Art In Stead was a large-scale urban exhibition debuting twenty-one new works by leading contemporary artists, presented simultaneously on billboards throughout Los Angeles beginning in February 2010. The exhibition was organized by MAK Center Director Kimberli Meyer, with co-curators Lisa Henry, Dr. Nizan Shaked, and Dr. Gloria Sutton, and public art consultant Sara Daleiden. The exhibition was accompanied by an overview exhibition and orientation station at the Schindler House. 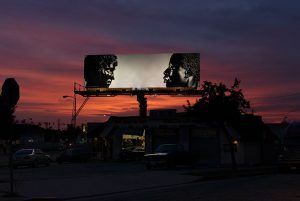 Artists working in the vein of California’s conceptual art movement were commissioned to create a new work that critically responded to the medium of the billboard and interpret its role in the urban landscape. Investigating art as an idea as well as art as a media for critical intervention, the exhibition highlighted the interaction of Pop, conceptualism and architecture in Los Angeles since the late 1960s. Participating artists included Kenneth Anger, Michael Asher, Jennifer Bornstein, Eileen Cowin, Christina Fernandez, Ken Gonzales-Day, Renée Green, Kira Lynn Harris, John Knight, David Lamelas, Brandon Lattu, Daniel Joseph Martinez, Kori Newkirk, Yvonne Rainer, Martha Rosler with Josh Neufeld, Allen Ruppersberg, Allan Sekula, Susan Silton, Kerry Tribe, James Welling, and lauren woods. The exhibition followed nearly a decade of discussion amongst city residents and officials about billboards and their environmental impact on the city of Los Angeles. How Many Billboards? investigated the political and artistic implications of these media surfaces that saturate the city’s landscape, while also offering an alternative vision for public art display in Los Angeles, in which the city becomes the context for exhibition. ‹ Art is the Message of these Billboards.